The 45-member Wind Ensemble is under the direction of Karl Krelove. High school wind and percussion musicians perform advanced repertoire for symphonic band. 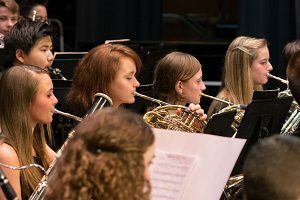 The Wind Ensemble performs in an annual fall concert in November and a spring concert in April. Other performance opportunities include field trips, extra concerts with either the entire ensemble or a chamber group, and our international tours. Please see YOBC Programs for more information about these and other opportunities. Click here for a list of repertoire the Wind Ensemble has performed.